This group of thirteen members has the legal responsibility for over site of the organization. Learn More. The Global Leaders for Young Children program at the World Forum Foundation seeks to identify and develop the next generation of early childhood leaders throughout the world. This program serves as a model of expanding capacity at the country and regional levels while building a cohesive community of international leadership to impact policy and practice worldwide. Learn More. To keep the Board of Directors and IAG informed of key early childhood issues in individual countries, and ensure initiatives are successfully implemented locally, experienced early childhood professionals are designated to represent the Foundation in nations throughout the world. Learn More. 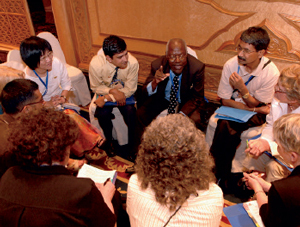 International organizations that become World Forum Alliance members are committed to supporting the Foundation’s mission. Organizations in the Alliance provide mutual support for each other’s initiatives. Learn More. The World Forum Foundation works with three key organizations that serve as administrative partners: Dimensions Educational Research Foundation and Community Development Institute. Through in-kind contributions, each organization supports a portion of the on-going work of the World Forum Foundation. Each of these organizations also serves as a major sponsor. Select the communications you would like to receive. 7700 A Street,Lincoln, NE/USA 68510"
©2019 World Forum Foundation. All rights reserved. The World Forum Foundation is a non-proﬁt, 501(c)3 organization.